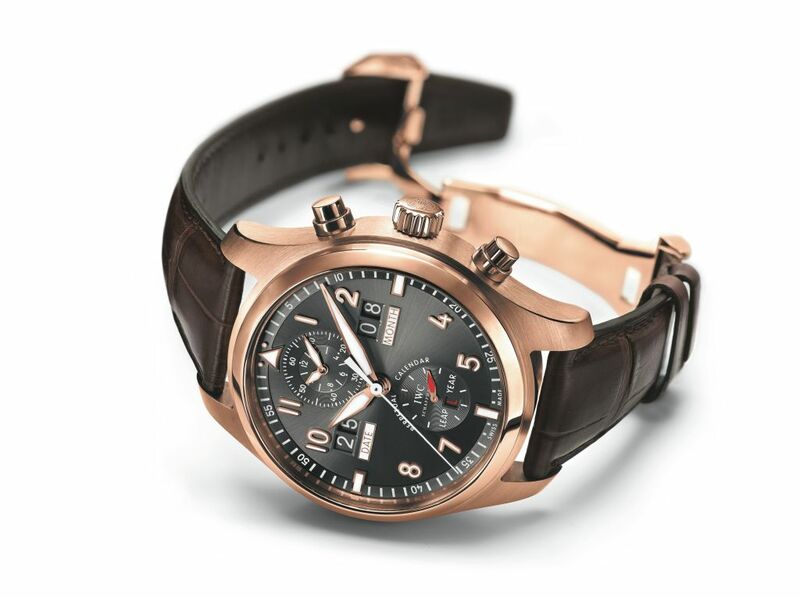 The Spitfire Perpetual Calendar Digital Date- Month is the first Pilot’s Watch launched by IWC Schaffhausen to feature a perpetual calendar, a digital date and month display, and an innovative stopwatch display. The IWC-manufactured 89800 calibre provides a suitable drive. Elegance, technological brilliance and a high performance drive are also the hallmarks of the new IWC Spitfire Perpetual Calendar Digital Date- Month (Ref. 379103), whose name was inspired by the legendary propeller-driven aircraft: the Spitfire. The multiple displays and complications on the dial of the Spitfire Perpetual Calendar Digital Date-Month underscore the prominent position it holds within the Pilot’s Watch family from IWC. They admittedly total below the 79 instruments found in the Spitfire’s cockpit, but they still represent an unusually large number for a pilot’s watch. Despite this, the dial is well balanced and very neatly arranged. This is the first IWC Pilot’s Watch to feature a digital display showing the date and month in large numerals. It was inspired by the cockpit instrumentation used during the pioneering days of modern aviation that showed vital data, such as altitude, in figures. Digital displays also have a long-standing tradition at IWC. Well over 100 years ago, the Schaffhausen- based manufacturer was integrating the Pallweber system into the first watches with digital hour and minute displays. This put IWC way ahead of its time. While many people today prefer an analogue display for the time, numerals have established themselves as the standard solution for the date. Nevertheless, in the case of a mechanical watch, it takes considerable technical expertise – and a sophisticated wheel train – to translate the day and month into the digital format seen on the dial. The latest version of the Spitfire watch with a perpetual calendar features an additional small window at “6 o’clock”, which displays the 4-yearly leap year cycle digitally. In 2012 this will include a leap day, the 29th of February. Naturally the perpetual calendar takes this anomaly in its stride, and the wearer has no need to think about it. Because of the three digital displays, up to five different discs may need to be advanced synchronously without having a noticeable influence on the watch’s accuracy. The energy required to do this is generated by a quick action switch designed specifically for this purpose. Every night, when the date display moves forward, it taps a little of the energy, stores it and then discharges it precisely at the end of the month when the date and month discs advance, and at the end of the year when the leap year disc also needs to be advanced. The perpetual calendar can be set easily using the crown. It will not require intervention until 2100, a year that breaks with the conventional 4-year cycle and will not be a leap year. But the Spitfire Perpetual Calendar Digital Date- Month brings another very special feature to the Pilot’s Watch family. While stopped times up to 60 seconds are shown conventionally by the central chronograph hand, the hours and minutes recorded by the stopwatch can be read off on the totalizer at “12 o’clock” as easily as reading the time. Thanks to the flyback function, the chronograph can be reset to zero without having to be stopped first. This function, too, has its origins in the aviation of the 1930s and 1940s when a pilot might have to fly certain curved radii by time or abandon a manoeuvre and start a new one immediately. To turn this innovative watch-within-a-watch into reality, the designers integrated a particularly efficient double-pawl automatic winding mechanism into the IWC-manufactured 89800 calibre. 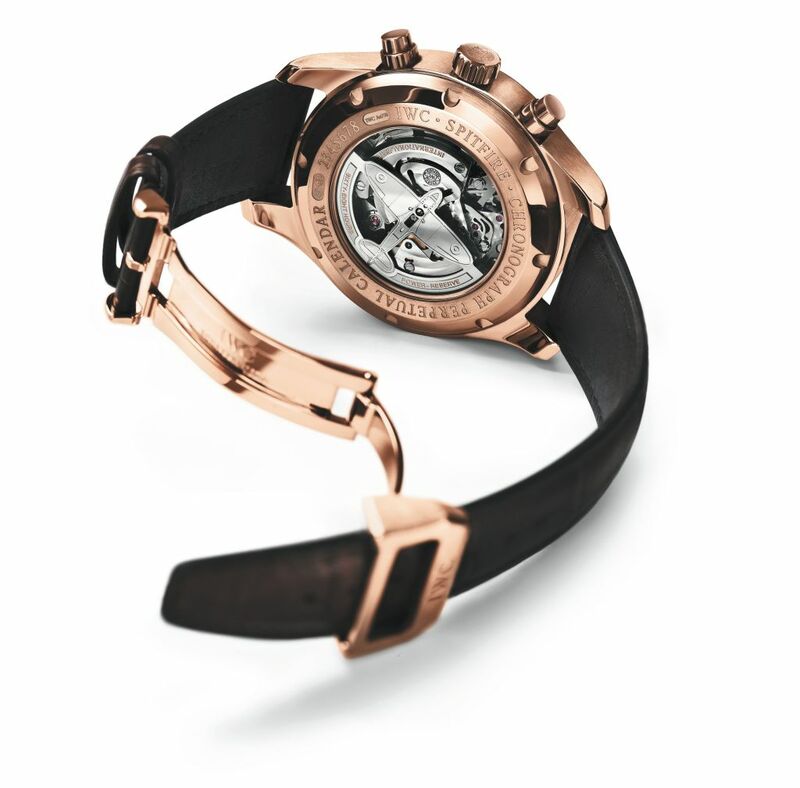 The movement consists of 474 individual parts and builds up a power reserve of 68 hours. The sapphire-glass back invites you to take a look at the movement with its unusual rotor in the delicate shape of a Spitfire silhouette. But the watch is special, not only because of the choice of 18-carat red gold for the case and push-buttons, but also for its elaborate surface machining. Exposed areas like the casing ring, push-buttons and case back are carefully handfinished by experienced specialists. The dynamic interplay of polished and satin-finished surfaces is integral to the watch’s unusual design. The shimmering, slate-coloured metallic dial, with its sun-pattern finish, creates an enchanting contrast with the warm gold of the case and the brown tone of the leather strap. Both elements, metal and leather, are intrinsic to the classic pilot’s watch feel. Hands, numerals and the goldplated appliqués are coated with luminescent material and facilitate excellent legibility, both by day and night. Features: Mechanical chronograph movement, stopwatch function with hours, minutes and seconds, hour and minute counters combined in a totalizer at 12 o’clock, flyback function, small hacking seconds, perpetual calendar, large double-digit displays for both the day and month, leap year display, screw-in crown, glass secured against displacement by drop in air pressure, see-through sapphire-glass back, rotor in the shape of a Spitfire.